This. Was. Great. I love lasagne but its time consuming and expensive to make. 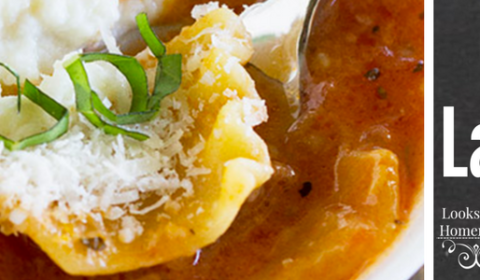 This Deconstructed Lasagne Soup Recipe was the answer to my dilemma. I adapted a recipe from PeggyUnderPressure.com to fit what I had on hand and our tastes. She made balls with the ricotta and mozzarella and I just put spoonfuls into the soup. I’m anti-fussy. If you don’t have a pressure cooker – this could be easily done on the stovetop or in a slow cooker – I wouldn’t really adjust the recipe much – if you use a slow cooker I’d precook the noodles and then add to the soup the last 20 minutes before you serve it. 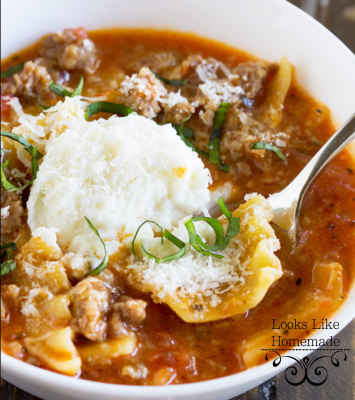 A great soup for weeknights, company or entertaining! Broken up Lasagne noodles about 1/2 a box. Set your pressure cooker to "Brown" and crumble up the Italian sausage in the pot, cook through then pour out onto a paper towel lined plate to drain. While meat drains, add onions and garlic to the pot and cook until translucent, add in the tomato paste and the Italian seasoning - heat for 2-3 minutes until you can smell the tomato paste - add back in the meat. Add the diced tomatoes and the chicken broth and the water. DO NOT ADD THE PASTA YET. Place the lid on your pressure cooker and set to high pressure for 10 minutes. Because of the high volume of liquid, this will take awhile to get to pressure - so allow for the time. While soup is cooking, mix the ricotta cheese and the mozzarella cheese in a small bowl and put in the fridge to firm up a bit. When the pressure cooker is done, do a 10 minute Natural pressure release, then drain off the rest of the pressure manually. Add your pasta pieces in, stir it around, and replace the lid. Set to High Pressure for 2 minutes. When it's done - do a 4 minute Natural Pressure Release, then manually release the rest of the pressure. Serve with a scoop of the cheese and enjoy. Vegetarian Potato Curry – Yum!